The treatment of wine differs extensively across the states, and at higher rates than beer because of greater alcohol content. Check out today’s map below to see where your state lies on the wine tax spectrum. 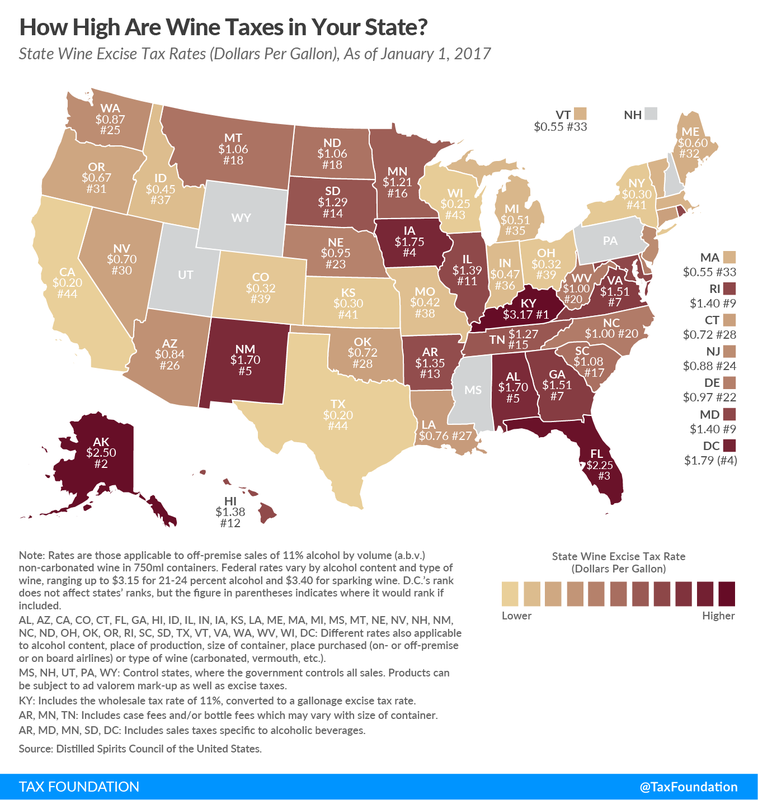 Kentucky has the highest wine excise tax rate at $3.17 per gallon, followed by Alaska ($2.50), Florida ($2.25), Iowa ($1.75), and New Mexico and Alabama (tied at $1.70). The five states with the lowest wine excise rates are California ($0.20), Texas ($0.20), Wisconsin ($0.25), Kansas ($0.30), and New York ($0.30). Notably, these rankings do not include states that control all sales (New Hampshire, Mississippi, Pennsylvania, Utah, Wyoming). Wine excise rates can include case or bottle fees dependent on the size of the container, as in states such as Arkansas, Minnesota, and Tennessee. Additionally, rates may include sales taxes specific to alcoholic beverages and wholesale tax rates, as in Arkansas, Maryland, Minnesota, South Dakota, and the District of Columbia.